In the past three decades, Afghanistan’s people have endured the devastating impact of violence through foreign invasion, civil war, and insurgency. Though the volatile political situation in the country is a hot-button issue of international prominence, victims of the conflict have largely been excluded from the war discourse. In this podcast, ICTJ speaks with Hadi Marifat, founder of the Afghanistan Human Rights and Democracy Organization (AHRDO). ICTJ, AHRDO and local Afghan organizations are working together on an innovative arts-based approach to discussing Afghanistan’s conflict and transitional justice issues at the grassroots level. Community theater provides a space for victims of war to connect with one another and share their experiences. 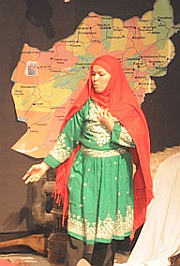 Though the political context of this approach is unique to Afghanistan, Mairfat believes that using theater can be a viable technique to reach victims in other societies emerging from conflict. AHRDO is currently on tour in the United States, performing a piece entitled “Infinite Incompleteness” in Washington DC on November 5 and in New York on November 8.